Create your own magic at Mountain Magic! This incredible Gatlinburg cabin offers all the best from the youngest to the youngest at heart including a pool table, Ms. Pac Man/Galaga multicade, air hockey, and Golden Tee arcade game. 2 King Bedrooms both with private bath, vertical jetted shower, and HD TV. 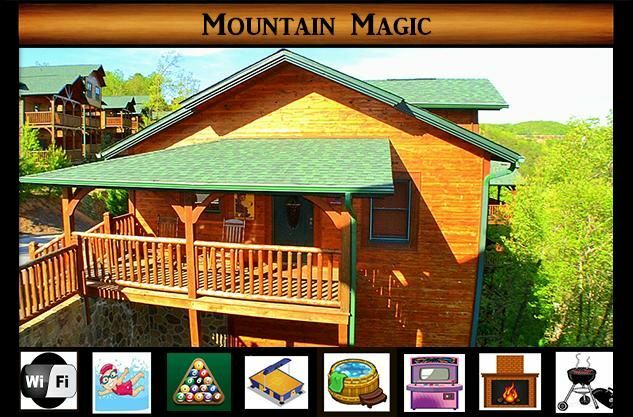 Mountain Magic offers a premier location less than 5 minutes from downtown Gatlinburg. Only 15 minutes to Dollywood and Pigeon Forge. This cabin has breathtaking views of the Smoky Mountains. With natural light streaming through numerous windows and Hot-tub on the deck. There is a spacious kitchen and open dining area. After dinner snuggle up in front of the stone fireplace, play a game of pool or air hockey in the rec room, or enjoy the tranquil mountains while relaxing in the rocking chairs on the deck. This serene mountain retreat is a must-see! Enjoyed our stay. Our condo was very close to all the action. Great views, just needs some tended loving care. Same as with most rentals. We are glad you enjoyed your stay at Mountain Magic. Thank you! My family had a great visit in Gatlinburg. This home was great. Very clean and up to date. My only reason for a 4 is that the kitchen could have been a little better stocked. Otherwise a great family place. Thank you for staying with us at Mountain Magic. We just recently restocked this kitchen with new dishes, new pots and pans, new utensils, glasses and lots more. If you would like to send us a private email to let us know what was missing from the kitchen, we would appreciate that. Thank you again! Thank you so much! We are glad your vacation was perfect! My family and I had a wonderful Christmas Vacation. We loved the Christmas Tree and everything. It was better than we expected. We will definitely be back. We are so glad you all enjoyed Mountain Magic! We would love to have you back! We enjoyed our stay. Very clean, beautiful little Christmas tree. The master bathroom & bed mattress could use a little updating but overall nice! Thank you! We are glad you enjoyed your time at Mountain Magic! We are ready to do inspections and will definitely check the mattresses. Thank you for letting us know. We hope you can come back again! Thanks again! Merry Christmas to you! Thank you! We are glad you enjoyed Mountain Magic. We are doing thorough inspections on beds and everything as soon as the holidays are over and there is a break in guests. We will double check the noisy beds. Thank you for letting us know. We hope you can come back again! Thanks again! Free driving trails: Coves Cove, Roaring Fork Motor Trail & Little River Road. Hiking Trail: 80+ trails. Entertainment Shows & Dinner Shows: comedy, magic, country, christian, oldies, live animals). Amusement Parks: Dollywood & Splash Country. Outdoor Activities: rafting, water tubing, horse back riding, 4-wheeling, helicopter rides. Shopping: Tanger Outlet with 38+ stores, Gatlinburg Strip & Wears Valley for antiques.